When our son was about 2.5 he asked me “What does Star Wars smell like?” Now, it happens that I actually do not have a sense of smell, so I would not be able to answer a questions about what ANYTHING smells like. But since I cry when I chop onions, I sneeze when someone wears too much perfume, and cough when I burn the chicken, I at least have some vague concept that different things smell differently. Still, I was WAY out of my depth on the smell of Star Wars (though we have all heard about the Tauntauns stinking). So, we asked dad (who is THE Star Wars expert in our family, and has an exceptional olfactory system to boot), but he had no idea either. Well, I am happy to tell you that we now have an answer. Star Wars smells like vanilla and lavender. 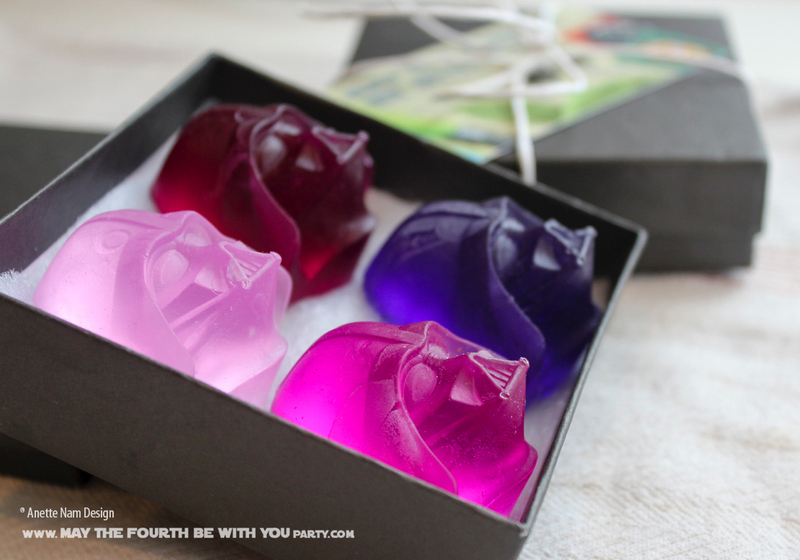 Here is how we know: We made Star Wars soaps. Me and #1 (my daughter, and, I know, I am mixing sci-fi universes here) had never made soaps before, and oh boy was it fun! Everyone we know got Star Wars soaps for Christmas. Seriously! We made them in all different shapes and colors, and we scented them with my daughter’s favorite scents (since I obviously couldn’t help in that department). Other than giving as Christmas presents, there are a lot of uses for these. It is a really fun activity for kids and adults alike. You could make the soaps at the beginning of a party, and they would be ready to take home by the time everyone got to leave. Or they would make really fantastic wedding favors for your Star Wars-themed wedding. Set up your work station on a placemat or cutting board. It is so much easier than to try to get all the soap drippings off your table or counter, at clean-up time. Add a drop or 2 of your favorite color. You can mix colors (we mixed Red, Blue and Yellow to get the grey) Remember, a little goes a long way. You can always add more color. Add a few drops of your favorite scent (we used Vanilla for all Stormtroopers, Lavender for X-Wings and Darth Vaders). Watch any 2 Star Wars movies while you wait for them to cure. Waiting is by far the hardest part when you are excited to see how they turned out! But you gotta wait, if they are not totally hardened they will deform as you take them out of the trays. Take them out, and ways your hands! Move quickly – the soap thickens fast. If it does gets too hard, pop the pitcher back into the microwave for a few seconds. If your color gets too dark, or is just not right, you can always melt more soap, and add to you mixture. No need to toss. The same goes for the soap, if some gets deformed, you can just melt and start over. Once you use the Silicone trays for soap, I recommend that you do not use them for food again. ← Smile, it’s Star Wars Time!